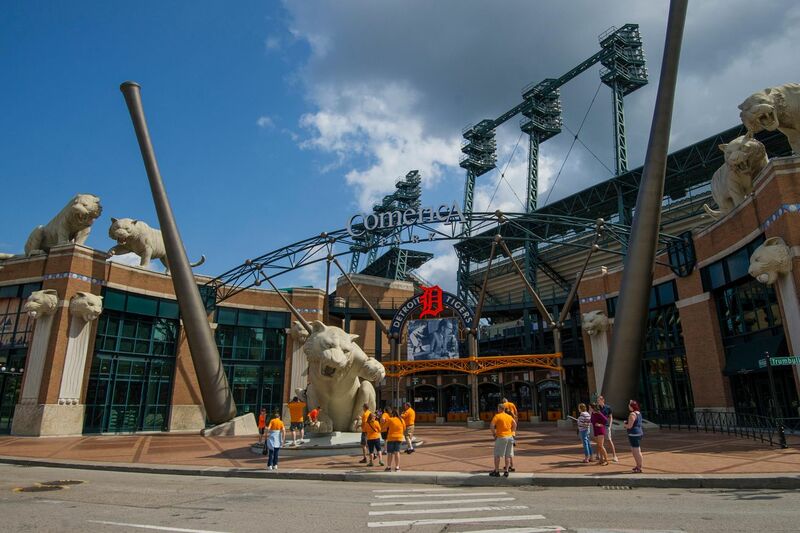 Way back in June, there were rumors that the Tigers organization might be considering a meaningful renovation to Comerica Park. That rumor led to quite a bit of discussion among Tigers fans. This thread was just a piece of it. Comerica Park is going to get some sort of renovation. What would you like to see? Fences moved in? More clubs/premium seating and spaces? A roof? The singing hot dog guy to come back? The most prevalent topic of conversation at the time was adding a retractable roof or changing the unusually large outfield. I'm sure ownership was most concerned with upgrades to the spaces that host high-paying customers, like fine dining and more luxury accommodations. Of course, we all see the need for at least two new statues in left field for the two newest inductees to the Hall of Fame (let's make it three with Sweet Lou as well). We could also talk about meaningful changes to the way the seats are configured. Those are all worthwhile conversations. This comment has been in the back of my head ever since, though. I'd like to see something like what the Red's have in a mini museum for past Tigers teams. Aside from the statues and few info stands at the west entrance there is very little history of the Tigers actually showcased. I can't say that I've ever been to Great American Ballpark in Cincinnati, but their museum sounds like a pretty interesting place for Reds fans. I want to add something similar to Comerica Park. Sure, it could be great to display memorabilia pertaining to Tigers past and present just like the Reds have -- that could be fun. Let's talk about the history at Tiger Stadium. A nice tribute to Ernie Harwell would be a must as well. But, I want to use baseball as a hook to talk about a lot of other stuff -- more than just baseball. Visitors walk in because they are interested in the game and this team specifically, but they learn about topics that are meaningful well beyond the game itself. This team alone has players from across the country and around the world, particularly the Dominican Republic and Venezuela. Here's an example of the Angels marketing department reminding fans that players come from all over. Just the simple geography lesson and a little bit of exposure to the player's native language would be worthwhile in and of itself. But, why not also talk about what is going on in those places. How different is the culture? Is the food different? What is it like for people to transition from those far away places to a new home like Detroit? It has taken a while to get fans to use accent marks and tildes in players' names -- this goes way beyond that. Most players have a seemingly random thing that they really care about. But, these causes aren't random to them at all because their lives have been touched by these causes in some meaningful way. Medical causes, parts of the world, they all have something they care about. Imagine giving individual players the opportunity to take the lead on an exhibit that will be seen by thousands of visitors. They'd have a very unusual opportunity to talk about something they are very passionate about. What is it really like to broadcast games on radio/TV? How about the play-by-play and color commentary roles? We listen to broadcast teams as they weave their jobs together with total ease. It would be cool to dig a bit deeper and see how they feed each other with stuff to talk about. I could imagine a setup that would let fans sit in a small booth and try to call a segment of a game. How about having that open while a live game is actually being played? Next, turn to the production work. Let's break down how stats are prepared and available for graphics. How about preparing those graphics packages to begin with. How much time and energy goes in to making them? It would probably be cool to see a breakdown of all of the camera angles that are available to producers and what each camera's job is based on certain types of plays. That could end up being an even better illustration of teamwork than the play on the field. I could imagine an exhibit that shows all camera feeds that are available for a given play and then have visitors try to switch between feeds in real-time as a play happens to show people at home what is happening. The Exploratorium in San Francisco has an online exhibition devoted to this idea. Imagine taking baseball and using it to teach kids about basic motion through space (physics teachers call this kinematics). Motion, velocity, acceleration, gravity, etc. How about using curve balls to demonstrate airflow, resistance, and drag. There's a lot to be learned about elastic and inelastic collisions to learn why a ball bounced off a bat like it does but then doesn't bounce off a catcher's mitt. How are the two different? Let's create a whole exhibit that walks through some of the new advanced stats that are used in the game now. How are those stats more meaningful than more traditional stats. How about measuring these stats, too? Let's have an area where visitors can stand within a few feet of a 95 mph fastball and then see a readout of things like spin rate. Create one space where visitors can throw their own pitch and then see how it gets measured. On special occasions, let's convince MLB pitchers to do a part of their daily pitching routines in that space so fans can watch close up and can see how pitches are measured. I would imagine local college and high school pitchers might jump at the chance to get access to a quality analytical setup, even if it means opening it up to members of the general public to watch the process. Think about everything that can be learned about the human body using baseball as the hook. How about an exhibit solely looking at the forces and movements of a pitcher's shoulder. Imagine a moving model of a pitcher's shoulder showing when and why each muscle engages. Why do starting pitchers only pitch every fifth day? I mean, we all know they need time to recover, but how about learning what that actually means inside the body. How does the body actually recover? What is different about a pitcher's job as opposed to an every day batter -- in physiological terms. How about how core muscles work during a home run swing -- and compare that to the same muscles during a routine grounder and throw to first. We can also take a deep-dive into common injuries that we hear about often. Just learning about Tommy John surgery would indirectly teach someone more about the elbow than the vast majority of the public understands. I'd like to see a nice exhibit telling the story of the Detroit Stars. Do you know much about their history? I don't. Even the Wikipedia page is a bit lacking. Do you know when the Tigers finally integrated? I don't know that either. Do you know who those first few players were? What their stories were? How were they treated by fans? How about fellow players? A quick Google search tells me the first non-white player was Ozzie Virgil in 1958. The Tigers were the second-to-last team ahead of only the Red Sox to have an African American play when Larry Doby joined in 1959. We should know these stories. Who were the players before them who were left out simply because of race. What could they have done for the team if they had been allowed to play? How did the media cover them? I bet someone could dig up an opinion piece from the local paper saying they shouldn't be playing. Let's also find some other physical characteristic that has no impact on ability to play and imagine not allow them in. What if players with, say, a certain blood type, couldn't participate? Did you know there was a women's league in Michigan? I didn't. There were teams in Muskegon, Kalamazoo, Grand Rapids, and Battle Creek. There's even a documentary about them. Who played for them? How were they treated by fans and the media? The bigger question looking forward to today: Since then, women have been working their way into the game from many angles. Let's talk about them! Did you know that the Tigers played a doubleheader on the day of the riots with most fans having no idea what was going on? Broadcasters were instructed to not mention the smoke that they could see in the distance. This would open up a big avenue to talk about really important cultural issues. Social justice, race, policing, you name it. Should the games have been played? Should the broadcasters have talked openly about what they saw? Should this have been an excuse to expose baseball fans to things that were going on in the city, knowing that some of their listeners may not watch nightly news regularly? This could be really hard-hitting and meaningful. We're way beyond baseball-focused paraphernalia, here. This is serious stuff. Speaking of the fan store, that store should be adjacent to the museum and also carry items related to the museum. Every decent museum has a good gift shop. Yeah, they sell knickknacks like clothes and posters but they also sell books and other stuff that can teach visitors more than what they can absorb in a single visit. Why not combine the two? Once again, there's perfectly good reason for this shop to have both interior and exterior access so folks can visit on non-game days. Where would it actually fit? Well, it wouldn't be a simple addition anywhere. This is, after all, an active used ballpark in an urban area. But, I think it would be well worthwhile. The urbanist in me sees all of those parking lots and sees more than enough space to add meaningful building density (or replace building that needed to be obtained for this purpose). How do we get by without some of that parking? We transport more and more people to and from the site using something other than cars. You know, trains, subways, buses -- the stuff Detroit doesn't really like! But, that's a whole other story. I guess for now ugly surface parking lots become more ugly multi-level parking structures. So, there is another venue that is the home of another franchise right next door. Instead of being focused on just the Tigers, it could be a dual-sport focus with direct access to both Comerica Park and Ford Field. This is a FanPost and does not necessarily reflect the views of the <em>Bless You Boys</em> writing staff. GameThread: Tigers vs. Pirates, 6:40 p.m.